A model and famous football player....a recipe for the perfect romance? Cautious and careful Willow has refused a relationship ever since handsome Corbin broken her heart four years ago. Four years have past by and when they fall into each other's lives again confronted with a missing person case, Willow is determined never again to feel for him, and he's determined to win her back. 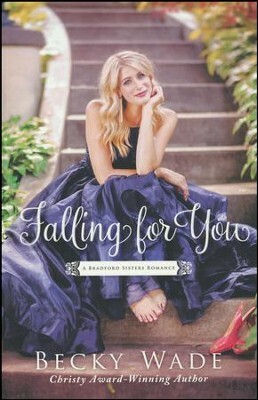 Once again she crafts a lovely romance fiction book with just the right amount of mystery, feel-good chemistry, and humor. She made me smile dozens of times and Corbin and Willow's constant bickering is a sure to be pleaser with readers - myself included! I loved the chemistry between them as Williow tries so hard to pretend that there isn't something between them! I've been a fan of Becky Wade pretty much from the beginning and she continues to never disappoint! I love her family-dynamo and the inside look at a famous human who just wants something normal in her life. Willow's sisters are wonderful and I can't wait for the next installment! I always enjoy series' that focus on families and reading about the Bradford's makes me want to join their's. A sweet book about second-chances and trusting God first and fore-most. Thank you Bethany House for this complimentary book in exchange for my opinion! AHHH you got a copy of this book!! I requested one but didn't do it in time. :( I read the first book and the prequel and really enjoyed them, so I'll have to see if I can snag a copy of this one elsewhere! Aw too bad girl! Totally pick up a copy - it's beautiful!